On this page you will see and read about the evolution of radio in the 20th century. 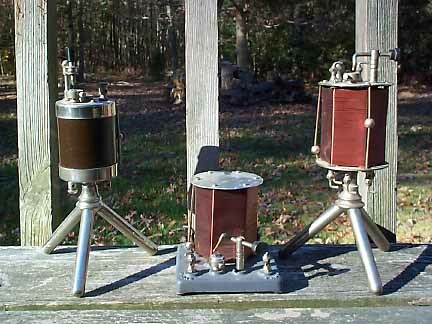 Three crystal radio sets from the early days of radio. Crystal sets were the simplest and least expensive radio receivers. 1921 Colin B Kennady Model 110 Detector unit and Amplifier unit. 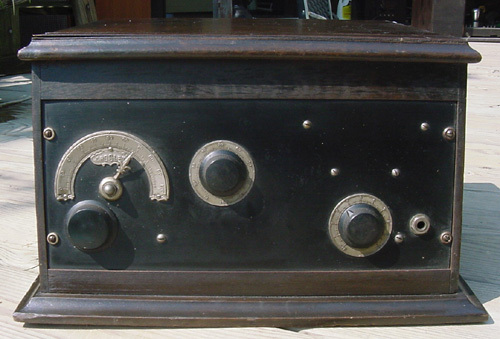 Radio sets were sold in sections by early manufactures. You bought the detector section wich may have been regenitive with 2 tubes in the unit like the 110 here. Then you bought the amplifier section to increase the audio output. This gave you the choice of using headphones or a horn style speaker. This was popular from 1920-1922. 1922 DeForest DT6 Radiophone crystal set. Note Galena crystal and cats wisker on front panel. Crystal sets were the least expensive receiver to buy in the early 1920s. Simple to build,and worked well for headphone use only. 1923 Atwater Kent 6c breadboard style set. Atwater Kent breadboard sets are valuable collecter items. 1924 Crosley Model 52SD. Two tube regenitive set. Powel Crosley was known as the Henry Ford of radio. He beleived a good quality product at a price everyone could afford. 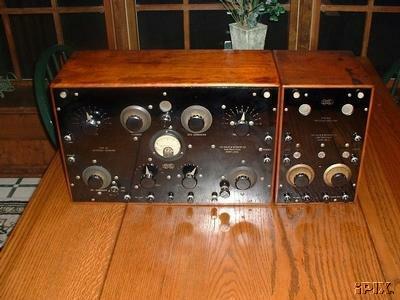 He also owned radio station WLW which in the 1930s for a brief time at 500kw was the most powerfull radio transmiter in the U.S.
1924 Radiola X (10) 1920s highboy style cabinet. Built in speaker, battery compartment, and rotatable inside loop antenna were the features of this radio. 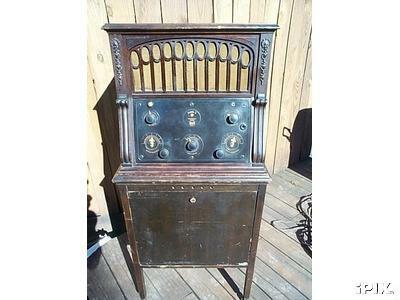 Console radios in the mid 1920s were very expensive. 1924 Zenith VII Super. Zenith from the start built high quality radios. Thier early slogan in the ads of the 1920s was The Royalty of Radio. The table model shown here along with the console model had room fro the batteries or battery elimanaters so you could run the radio on ac power. Photo is from Western Historical Radio Museum. 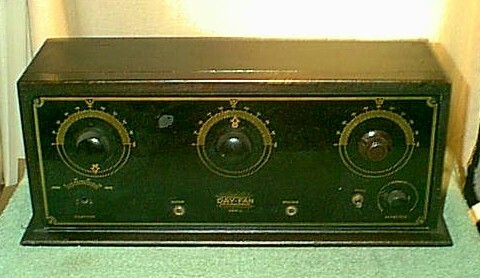 1925 Dayfan OEM three dail reflex circuit set. Dayfan was later bought by General Motors and became part of Delco. Radio technology advanced rapidly in the 20th century. What started out with mushy sounding code signals advanced quickly with in two generations to hi fidelity music. You can read or see from the pictures on this page the evolution of radio. 1900 the first year of the 20th century Marconi and Lee DeForest attempt to cover The New York yacht races by wireless. This fails due to each others equipment jams the signal from their equipment. Sir Oliver Lodge in England solves the problem by inventing the tuning condenser. In Canada Reginald Fessenden transmits his voice over the air in his lab. Fessenden also comes up with hetrodyne signal system. 1901 Marconi sends the letter S in code (...) from England across the Atlantic Ocean and recieves the signal In Newfoundland Canada. 1904 J Abrose Fleming invents the diode vacume tube. 1906 Three major things happen in radio that have the most impact in its future. First DeForest invents the audion vacume tube triode. This makes all aspects of radio possible. Second Fessenden on Christmass Eve from a shore station sends out a voice signal along with music that is heard by shipboard wireless operators. This is radios future format. Third Pickering discovers that certain minerals can detect radio waves. Galena,perikon, and others will work. This allows a inexpensive receiver that anyone can buy or build can now listen to the airwaves. 1909 Schenectady N.Y Dr. Alaxanderson comes up with a high frequency alternator. Theese become the most powerfull way of transmiting cw signals over the air. One is still in use today by Radio Sweeden. 1912 The first radio regulation law is passed. The radio act of 1912. Amateur radio operators are given the area 200 meters and down. The sinking of the Titanic bring wireless to the forefront. It becomes maditory that wireless is to be installed in all ocean going ships. Wireless ship stations must be maned 24hrs a day. Charles Jarod starts limited regular broadcasts of voice and music in California. Deforest discovers feedback. Edwin Howard Armstrong goes to work on how DeForests audion works. He discovers that if you feed the signal from the grid of the tube back into the plate of the same tube it increases the tubes amplifacation.He calls this circuit regeneration. He also discovers that after a certain point the tube will start to put out its own signal. Now the vacume tube can be used in all areas of radio. The ARRL is formed. 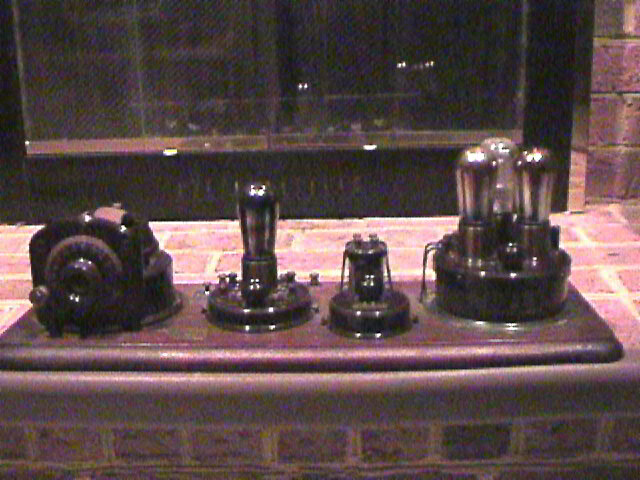 1914 Deforest sell the rights to the audion tube to AT&T for $50,000. The phone company puts the tube to use in repeater circuits which makes long distance calls practicle. 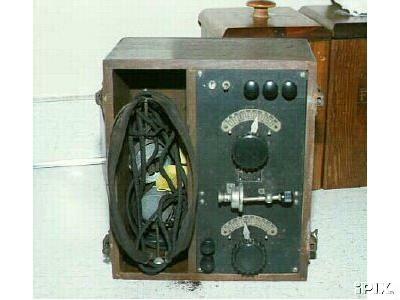 1915 Bell telephone publicly demonstrates a working radio telephone tube powered sytem. Frank Conrad founds the radio section and school for Westinghouse. He builds his first tube radio to check the acurracy of a new watch by picking up the time signals from the Commerce Department in Washington D.C. His watch is right on time so he wins a $5.00 bet. 1917 The U.S enters WWI. This is a savoir for radio. Radio development is stalled due to patent rights cases in the courts. The Navy department takes cotrol of radio. Amateurs are told to take down their antennas and stop transmiting. High power private land stations are taken over by the Navy. The Navy freezes the court cases untill the wars end. The Navy contracts out all work to large companies whos teams of scientists and engineers make improvements in tubes and wireless and radio equipment. 1918 Over there in France Armstrong,Harry Hauck,and Lemuire invent the superhetrodyne circuit. This will become the most widely used circuit in radio. 1919 The Radio Corperation of America is formed. The Navy Department wants radio American controlled and owned. The Navy Department forms a pool of the existing radio patents. General Electric,Westinghouse, AT&T,and Western Electric were members of this patent pool. American Marconi was bought out by a stock buy and RCA was formed as a result. Amateurs are back on the air. Private stations are given back to their owners except for two higher power Alexanderson alternator stations. One the Navy keeps for trans-atlantic use and the other goes to RCA. Frank Conrad in Pittsburg PA starts limited broadcasts of voice and music from a home studio. 1920 Armstrong sells. to RCA the patent rights to the superhetrodyne circuit. Harry P. Davis head of Westinghouse notices the ad for a local department store selling crystall sets so people could listen to Conrads music and voice broadcasts. Davis figures Westinghouse can sell its equipment to people so he announces Westinghouse is going to regularly broadcast music and voice programs. He applies to the Commerce department for a specail use license. One is granted in October 1920. The call sighn for the station is KDKA. Davis lets the local papers know that Westinghouse was going to broadcast the election returns of the Hardig Cox election. Harding and Cox were running for president. Westinghouse built a studio on the factory roof and went on the air. It was a biig success. The radio craze was started. 1922 Armstrong invents the superregenitive circuit. This is the most sensetive circuit to date. RCA buys the rights to this circuit from Armstrong. RF stages in radio circuits are becoming popular. 1923 Dr. Hazeltine invents a non regenitive trf circuit. Its called the nuetradyne. This circuit does not cause interference when tuning. It has good sensitivity and selectivity. Plus the tuning is accurate. No retuning like regens and crystall sets. Radio set sales reach 100,000 a month. 1923-1924 Radio is in trouble. The airwaves are over crowded so it is very noisy. Meetings are called in Washington. Four take place over between 1923 and 1924. As a result of theese meetings the maritme band is changed to its own band. The commercail band is now from 550kc-1500kc. Power levels and license classes are changed. This helps out but only for a brief time. RCA starts selling its AR-810 and AR-812 superhet models. RCA wont sell the rights to any other manufacture. The only other way to get a superhet was buy a kit or build one yourself. 1927 Radio needs help again. The goverment is told by the courts that it was illegal what it had done in the past in parts of its regulations of radio. The radio Act of 1927 takes care of theese problems. The FRC is created to control and regulate commercail radio. The commerce Department is given the control of the rest of radio. Radio engineers develope Crystal controlled oscillators. This gives better controll of frequencies. Radio engineers come with directional atennas so signals can go in specific directions. With the new regulations in place and the improvements by the engineers radio could really be enjoyed by all again. RCA releases ac powered tubes. The 227 226 and 280 rectifier tubes make light socket self contained radio sets possible. One dail tuning becomes standard. RCA also releases screengrid tubes. 224 222 are the tubes numbers. 1929 Philco releases its Model 95. This is the first radio with automatic volume control circuitry. Other manufactures start using screen grid tubes in thier second generation TRF sets. That ends radio developement up to this point. I will go on to the 1930s,40s,50s,and 60s on evolution of radio partII.